If you take statins to improve your blood cholesterol levels, some supplements may interfere with the effectiveness of statins or increase your risk of side effects, some potentially life-threatening. Supplements to avoid when taking statins include antioxidants, red yeast rice and grapefruit seed extract. Talk to your doctor before taking statins in combination with any kind of supplement or medication. Statins, generally well-tolerated by most users, provide the most effective remedy for reducing low-density lipoprotein – LDL or "bad" cholesterol. They can also help increase your level of high-density lipoprotein – HDL or "good" cholesterol – but not as well as some other cholesterol medications. Your doctor may prescribe statins with other medications, such as prescription-strength niacin. For safety's sake, keep your doctor apprised of all herbs, vitamins and supplements you take as well as medications. A supplement called red yeast rice provides some of the same benefits as statins. If you combine red yeast rice and statins, you increase your risk of incurring muscle tissue breakdown. This side effect, formally known as rhabdomolysis, may cause your kidneys to fail and could prove fatal. You may experience muscle cramps if you take statins. This rarely leads to rhabdomolysis, but let your doctor know about any muscle pain. Tests that measure your creatine kinase levels can distinguish the difference between muscle discomfort and rhabdomyolysis. Vitamins E, C, selenium and beta-carotene reduced the effectiveness of statins, according to the results of a study led by Greg Brown, professor of medicine at Seattle's University of Washington School of Medicine. Participants who took an "antioxidant cocktail" containing the four supplements along with statins and niacin realized less improvement in their HDL cholesterol levels than participants who took just statins and niacin. People who took only antioxidants derived no cholesterol-reducing benefit from them, according to the report published in "New England Journal of Medicine" in November 2001. The American Heart Association advises people taking statins to avoid taking any kind of antioxidants. Avoid taking grapefruit extract supplements – or eating grapefruit or drinking grapefruit juice – if you take statins. An enzyme in grapefruit impedes your body's ability to metabolize statins. This means you could end up with more statins in your system than intended, causing an accidental overdose. Your risk of side effects, including muscle tissue breakdown, would increase. 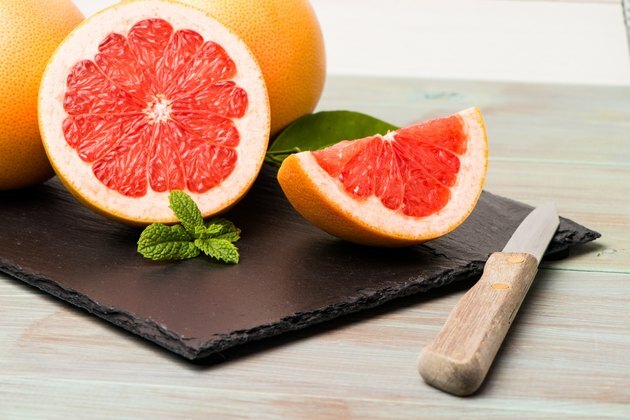 A single glass of grapefruit juice can reduce your ability to metabolize statins and other medications by as much as 47 percent, according to the Harvard Medical School Family Health Guide. How Much CoQ10 to Take With Red Yeast Rice? What Over-the-Counter Drugs Lower Cholesterol? Can You Eat Grapefruit While Taking Crestor?